His college roommate and former Amateur Of The Week showed him the competition ropes. Now, he can't be stopped. See how Garrett learned to be better at everything! I was always an active and athletic kid growing up. There wasn't a season that passed that I wasn't playing at least one sport, sometimes two. I started weight training when I was a sophomore in high school to better prepare myself for the upcoming hockey season. I was hooked within a matter of days! I loved seeing all the fit men and women at my gym and looked up to them. I started seeking out help from many of them and they were all willing to help me whenever they could, which was nice because I started to form friendships which made working out that much more enjoyable. When I was a sophomore in college, I became roommates with my good high school friend and training partner Justin Rivelli. 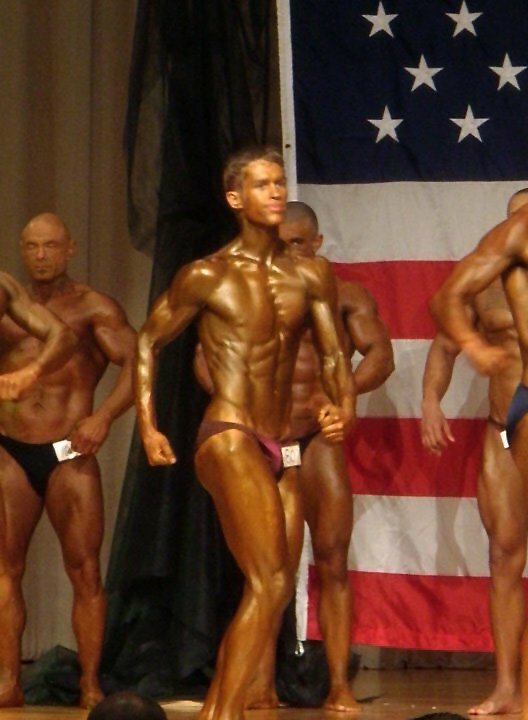 Justin had just spent a semester living with an amateur bodybuilder and learned a ton from training and eating the way his roommate did. Justin is the one who really got me started in the right direction. I never had any problem finding the motivation to work out, but didn't have a clue how to diet properly. I started eating my 6-to-8 meals per day, but still enjoyed the college life. It wasn't until the start of my senior year when I became fed up with being too fat and big. 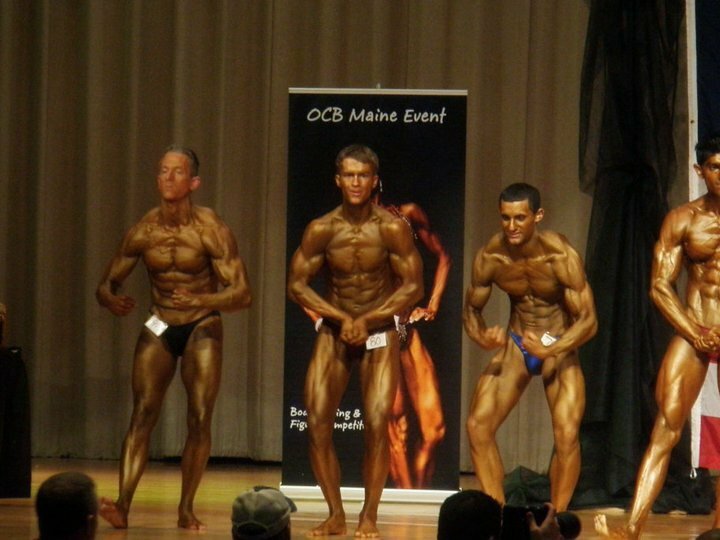 I started dieting for my first show during my senior year of college. Not only did I compete, but only a few weeks later I received my degree. I now work full-time and am studying for my Master's Degree in Construction Management. I prefer to change my workout routines every six weeks. I found that keeping my body guessing not only has the greatest effect on my physique, but it keeps me motivated. I look forward to new lifts every six weeks. With that said, I keep some major compound lifts in each routine such as deadlifts, squats, and presses. I also found that lifting heavy each workout is a great way to add size and strength to each muscle group. I also find it important to have a proper warm-up routine prior to each workout. Mine are mostly composed of some dynamic stretches and some light cardio for only five minutes. I switch my routines every six weeks. You name the routine and I have most definitely tried it before. Some splits are six days of weight training, with one day dedicated to just biceps and triceps. Some splits are four training days, consisting of two days of lower body power and strength lifts, followed by two days of upper body power and strength lifts. I find that workouts with a lot of volume suit me best. However, it is easy to burn yourself out this way, so I only suggest training like this for six weeks at a time before changing to a split with less volume and more time to recover. I find that mixing in low calorie days with the occasional high calorie days work best. Below is a sample of my pre-contest diet. My high calorie and high carb days are mostly the same, but I will add in 6-to-10 ounces of sweet potatoes or the equivalent of brown rice for meals 3 and 5. I will also lower my fats on high days. Typically, I will remove the peanut butter from meal one and add a few fish oil caps instead. My favorite supplements come from SciVation. I LOVE their whey protein; it's one of the best tasting and most consistent proteins I have sampled. It also makes the best "sludge" out there. I also use their intra-workout supplement, Xtend, which is a BCAA supplement. For my pre-workout, I use Gaspari Nutrition SuperPump250 or 5-Hour Energy shots. I love bodybuilding because of the battle you have to overcome with yourself. Not just physically - in fact the physical part is by far the easiest - I'm talking about the mental toughness it takes to compete. I always tell people that bodybuilding is 80/20: 80 percent mental and 20 percent physical. Bodybuilding has also taught me a lot about setting goals and how to go about achieving them. Bodybuilding should never control your lifestyle, but rather compliment it. You should be able to manage your bodybuilding as well as your personal relationships, work, or schooling. It was tough to do, but I set out four years ago to get my degree and I am finally there! The end results are so worth the hard work it takes to achieve them. The hard work makes achieving your goals that much sweeter. The buddy system saves lives and shapes physiques! What motivates me the most to follow a healthy lifestyle is the way I feel! I feel like I'm a 12-year-old kid again in a young adult's body! I always have enough energy to get through the days. I rarely fall into a lazy slump where I don't have enough energy to work full-time, study toward my Master's Degree, work out, help out around the house, golf, play hockey, spend time with my friends and girlfriend, take the dog for a walk, etc. ... you get the point. I always admired the physiques of natural bodybuilders and yearned to look like one someday. I used to watch them practice their poses at my gym when I was in high school and thought about how awesome they looked and how great they must have felt about their self-confidence. It really hit me when I stepped on the scale one day during my junior year of college and topped out the scale at a heavy, fat, 210 pounds. That was the heaviest I had ever been. I made my girlfriend take some pictures of me and I was disgusted with what I saw. That's when I became fully committed to competing. My plans are to take some time off now that my nutritional habits are set, and work towards adding some lean size and density to my muscles. I hope to take my newfound knowledge of nutrition and training and step on stage with a completely new and freaky looking physique. Seek help! Don't be afraid to ask questions, you will find that people who share a common interest will be more than happy to help. 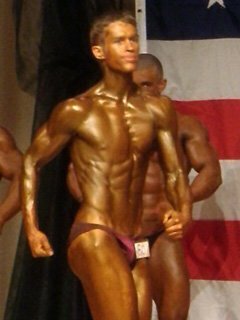 My first competition was a great success because I was able to step on stage in the best shape of my life, but next time around I plan on getting more nutritional and training help from my good friend and nutrition and exercise guru Justin Rivelli (former amateur bodybuilder of the week). I love the old timers like Frank Zane, Arnold, Franco Columbu, and basically anyone else from Pumping Iron. My favorite current bodybuilders are the all-natural pros like Alberto Nunez and Doug Miller. I think Alberto has the best physique I've ever seen. I love the Store! Tons and tons of choices at the best prices. Delivery is always hassle-free and very speedy. I also love reading about others successes as it motivates me to continue and achieve my goals both in and out of the gym. Trainer Credit: I owe a lot of my success to my good friend and trainer Justin Rivelli. Not only is he the most knowledgeable trainer I know, he's a great friend. We went to high school together and lived together in college for two years before he transferred to a different school to pursue his goals. He was my training partner for years, but now we live on different ends of the state and never get to work out together anymore. But that hasn't stopped him from being my training partner. He sends me detailed training splits and diet tips every six weeks, or whenever I ask. He always attaches some instructional videos if I need something cleared up for me and his phone is never out of arms reach (unless he is with a client of course). I urge everyone to visit his blog, https://justinrivelli.com/. It's packed with helpful nutritional and training tips and videos to help you train smarter and avoid injuries.